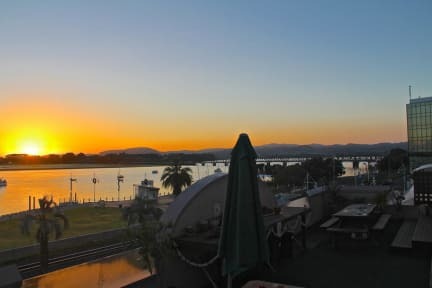 Harbourside City Backpackers is the place to be when staying in Tauranga. We are located right in between the bars, restaurants and cafes in the heart of the city whilst having the most peaceful view of the harbour on our front door step. We have a huge balcony on the second floor with waterfront views overlooking the Strand. It's a great place to meet other travellers and share stories. An extra treat for the early birds as the sunrises are truly amazing! We're only a stone's throw away from New Zealand's best voted beach, Mount Maunganui beach! Just across the bridge from us you'll find white sandy beaches. You can rent FREE surfboards from our sister hostel in the Mount so you can practice your surf skills! The friendly team at Harbourside City Backpackers will give you genuine advice and offer great deals on many activities and adventures to make the most out of your stay in Tauranga! From swimming with dolphins, glow worm kayaking, surfing to relaxing days at the hot pools. If you need to top up your travel funds, no need to look any further! We assist our guests with finding work in the area and as we have been doing this for over 14 years now, local employers sure know where to find us! Our social environment is great! Our communal areas are big enough for groups of people to eat or chat together and every other week we organise a great night for everyone in the hostel who would like to participate. This varies from the usual national and international holidays that we celebrate to winning prizes at Bingo night or Hostel quiz night and sharing food at international dinner nights. Also we offer FREE bikes to explore the sunny bay of plenty and FREE WIFI to tell everyone at home about it! Deteriorated building. Poorly designed electrical installations representing possible hazards. Kitchen in poor state of hygiene without regular garbage collection.